When I moved from New York to Oregon I had two cats. Driving them across the country would have made them miserable so I opted to fly. However, I was stressed out about how to the whole process works. I knew the cats would have to be screened with me but wasn’t sure if I had to take them out of the carrier. The security personnel was very helpful and both my cats were screened and put back in their carriers after walking them through the screening machine. I wish I had a better idea of what the experience would be like before heading to the airport. The TSA says to bring your pet to the security checkpoint in a handheld travel carrier. Your pet does not travel down the conveyor belt into the screener with your luggage. 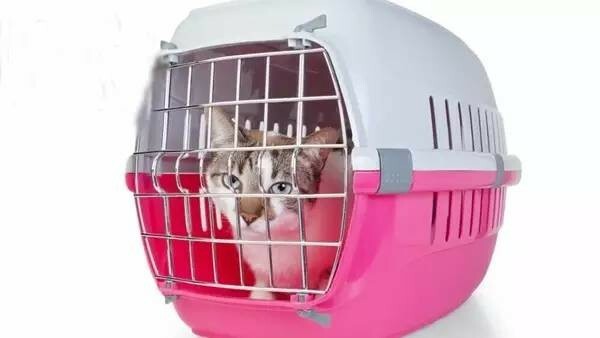 Instead, you most remove the pet from the carrier after you get yourself for screening. You may need to remove any collars from your animal. The pet should be carried through the screening process, meaning it goes through the metal detector in your arms. The security personnel allowed my cats to keep their harnesses on, but I had to remove the leash portion. I held the harness and the cat as I walked through the screening machine. After walking through, your hands will be tested for any trace of explosives. Once you are through the screening process, you are told to put your pet back in the carrier. Here’s a good tip: send your carrier down the conveyor first so that it’s ready on the other side when you are done. Also, try to keep your animal calm. Cats may have a more difficult time with this process. If necessary, you can ask for a private screening, so that way you can get your cat out of the carrier in a contained room. Have you traveled with your pet on an airline? What was your experience like during the screening process?